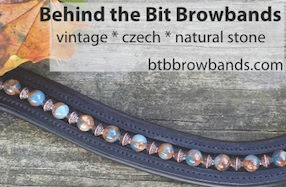 Behind the Bit: Holy hoofcrack, Batman! Arrgh. Another hoof crack, a lot like his yearling hoof crack but on the left front this time. Let's hope it grows out uneventfully like the other one did. Like the 2007 version, it appears where there is a notch in the hoof bottom. You can't see it too well in the 2009 photo. I have been having a similar problem with William. I bought him in November and prior to my buying him he was given the typical young Thoroughbred farm diet of, "lots of pasture and a little bit of cheap sweet feed". He also had his feet trimmed *maybe* once or twice in his 18 months on the planet. I fixed the diet and added a hoof supplement ( http://www.horseshoerssecret.com/hss_concentrate.htm and I also used Focus HF ) The new growth is awesome and looks very healthy. . .but the last remnants, about 1 inch, of his original hoof are now bearing the brunt of his activity. In typical crappy Thoroughbred hoof fashion the old hoof is literally crumbling off. My question with that crack on your baby's hoof, is it superficial? or does it seem to go straight thru? Hoof cracks are no fun. Can you also take a picture of the bottom of his foot, and a picture of the plane of his sole? 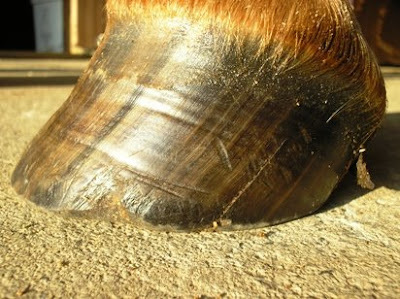 Hoof cracks can sometimes be caused by too much sugar in the diet, or caused by the horse putting more pressure on that side of the hoof (often because it isn't rasped down enough. Pressure can be alleviated by scooping out the quarters slightly as part of the trim, and making sure to bevel the hoof wall all the way around. 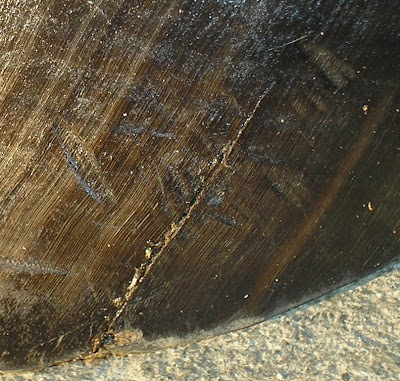 Here is an excellent article on hoof cracks. (Note - Riley's is very minor compared to some of the examples shown). I'm not too convinced that putting a scoop in the quarters. I would be afraid of reducing the contracting ability of the wall that pumps the blood back up the leg. Horses on different terrain will wear their hooves down differently, and I've only seen that scoop on feet that regularly travel on rocks. 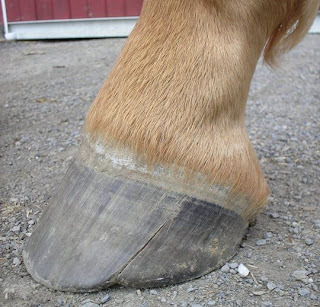 Their soles will be very concave, where a horse on flat, non-rocky ground will grow in a flatter sole and an even wall. On a young horse, it's far more important to be very balanced so that all joints and bones grow as intended. Just my opinion, of course. In the horse world, opinions are a dime a dozen.